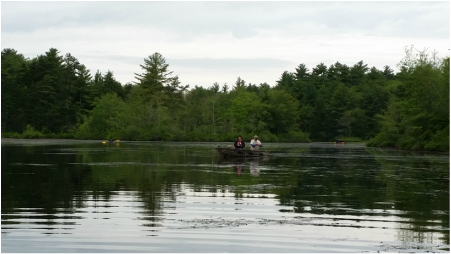 Freshwater fishing at the Rod & Gun Club of New Bedford is allowed year round at Cornell Pond which is just one of the many natural attractions located on club property. Ice fishing is allowed on Cornell Pond, but infrequently recommended as it is usually not safe. Members may also access shore fishing at the Copicut Reservoir which borders club property. 707 Old Fall River Road, Dartmouth MA. The public access way is maintained by the Dartmouth Department of Parks & Recreation. A charcoal grill, picnic table, and swing set for the children is available for public use. The public access way is accessible to club members and to the public year round, and there is no charge for use. Annual Bass Tournament (usually on the free fishing weekend which is typically the first full week in June). Fishing rod, bait, and tackle are required. Bug spray, snacks, and sunscreen are recommended. (except on free fishing weekend). Massachusetts Freshwater Fishing regulations apply. Boats on Cornell Pond are optional, but are not allowed on Copicut Reservoir.